Looks like last Saturday's Tangerine Saturday was a huge success as it returns for the next two Saturday! What is Tangerine Saturday? It is quite simple really. 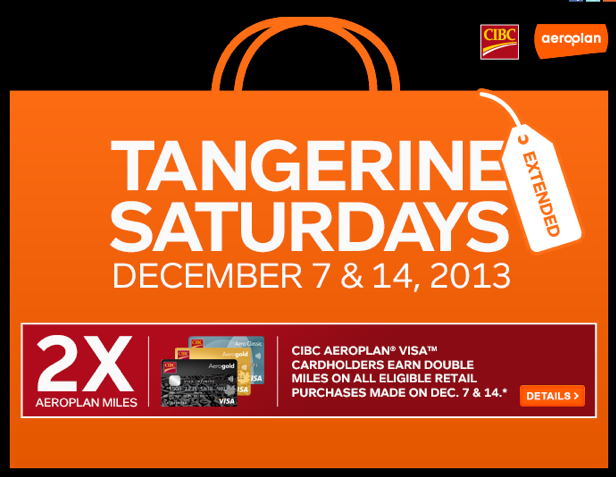 Essentially CIBC Aerogold cardholders were earn Double Aeroplan Miles on all eligible retail purchases made on December 7th or 14th only, in store or online. Eligible merchants include grocery stores, drug stores, department stores, specialty retailers and most online retailers but exclude (among others) travel, entertainment, dining, or telcom service providers. Bonus miles are awarded based on the sum total of purchases (including taxes but excluding any returns or disputed charges). Bonus miles are available for domestic transactions only. Bonus miles will be earned on top of applicable grocery and drug multipliers, as illustrated: All CIBC Aerogold Visa cards (other than CIBC Aero Classic Visa): 2X the Miles promotion = 1 Base Mile + 1 Bonus Mile = 2 miles (or 2.5 miles if applicable grocery/drug multipliers apply) per dollar spent. CIBC Aero Classic Visa: 2X the Miles promotion = 1 Base Mile + 1 Bonus Mile = 2 miles (2.5 miles, if applicable grocery/drug multipliers apply) / $2 spent.